Spornette Little Wonder Teasing Brush helps you volumize, back brush and tease with ease. America's most popular teasing brush has extended tourmaline-enhanced penetrating nylon and short boar bristles. The pointed handle of this Spornette brush makes it easy to section and grab hair while styling. Works great on short hairstyles, ponytails, buns and more. This boar bristle brush is perfect for adding bouncy volume to short hair and nailing glam up-dos. Measures 9" long x 1" wide x 1" high. 1. This brush is our secret weapon for nailing up-dos and adding volume to hair because the tail of the brush is perfect for sectioning and grabbing hair. The nylon and boar bristles perfectly tease to add bouncy volume. 2. 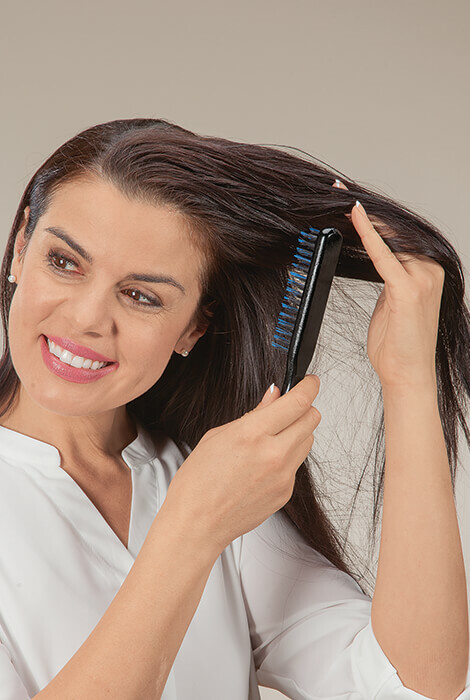 Start with dry hair and use the brush’s tail handle to section the top layer of hair from your crown into three or four sections. 3. Lift one section in the air and use the brush to comb from top to bottom in short, quick strokes. 4. Repeat steps for the other sections, and brush lightly over the top of hair. 5. Style as desired, such as a ponytail or bun, add some hair spray, and behold your newly glammed-out ‘do'.